Having arrived back from Thailand last week it didn’t take long to get right back into the swing of things. 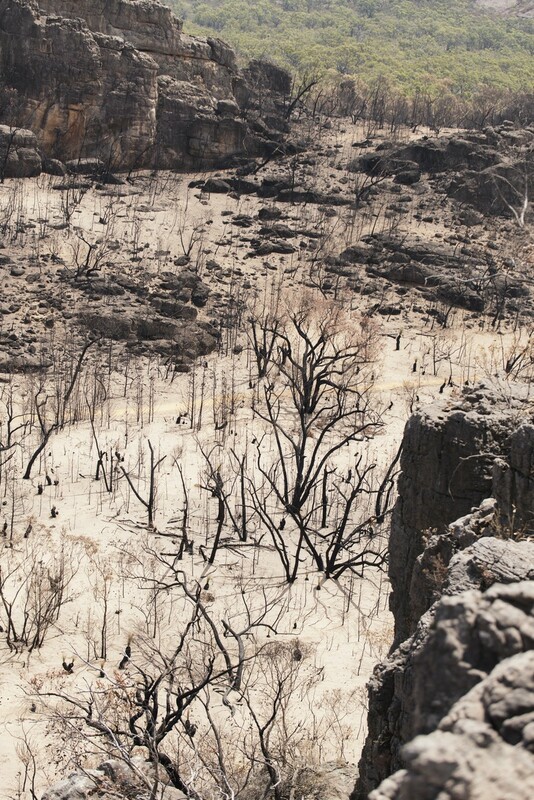 I will have more information soon on the closed burnt areas of the Northern Grampians. I visited the sites of Summerday Valley, Taipan and Stapylton Ampitheatre last Wednesday. It is still very early days when it comes to planning openings and work projects – of which there will be many. Once again, patience will be called upon. Bear with me as this post will be a long one and includes some relevant infomation from Parks Victoria. There are a few more updated areas to those that can be accessed for climbing in the other areas of the park. In the post previous to this from 23/1/14 it notes that the Victoria Range is open to climbing except for those cliffs along the Camp of the Emu Foot Track (note the new indigenous name is Janangin jawi) These cliffs are now open for climbing but there are some changes in the access to them. And these are permanent changes. Access is now only by foot. The track which was previously accessible for vehicles has been given a MVO status. Management Vehicles only. As noted above, this is not temporary, it is permanent. This has been a request by the Indigenous team and community and was a request that was in the pipeline previous to the fires. With the fragile nature of the area along with the high density of of cultural heritage sites in the Victoria Range, this has made it even more relevant. From a climbers perspective, it does mean that the walk in will be longer. For cliffs further along such as Weirs Creek definitely a fair hike. However it is really important that this change is understood and respected. The cultural heritage team and indigenous groups do want to work alongside other user groups so that we can continue to use these areas. Hopefully most climbers are aware by now that the Victoria Range is an exceptional place when it comes to cultural heritage, it should be protected and I would hope that climbers as a community will respect the measures that have been put in place. Please park out side of the gate and don’t drive in. If for some reason the gate happens to be open – same thing. It is a MVO track at all times. And do remember that this area is still very fragile. Take care and treat it as such. Keep to the one track. The same goes with the rest of the Victoria Range. In many of the areas, CliffCare and members of the climbing community have helped repair and mark tracks best that are the most sustainable. It is in everyone’s long term interest that we focus a little more on looking after the areas. 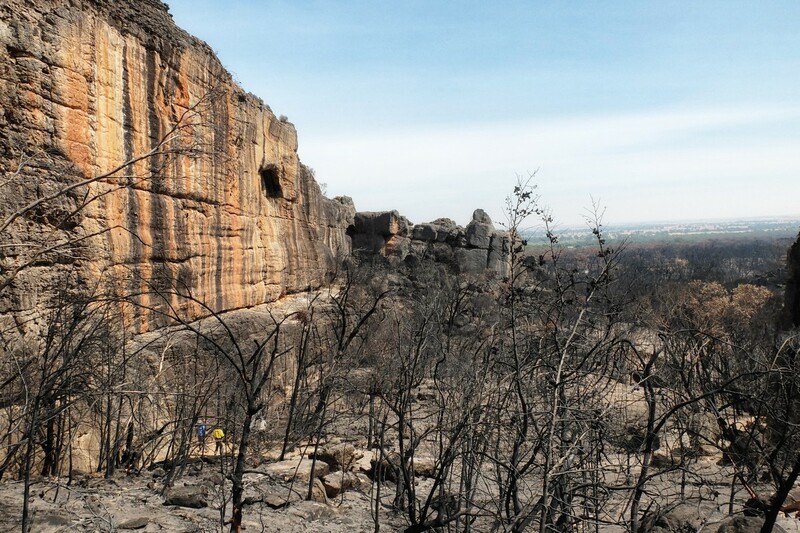 The Northern Grampians Fire severely burnt the natural environment and much of the park infrastructure in and around Hollow Mountain, Summer Day Valley and Mt Stapylton – this includes many popular rock climbing and bouldering sites; as a result there are many park closures in place. 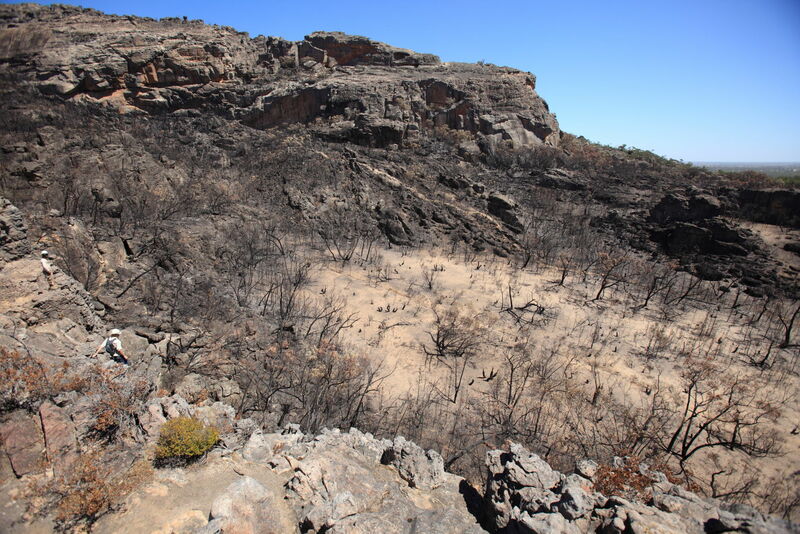 The dry, rocky landscape is now extremely fragile and will take a long time to recover – the fire burnt extremely hot so in many cases regeneration will now occur (very slowly) from seed. 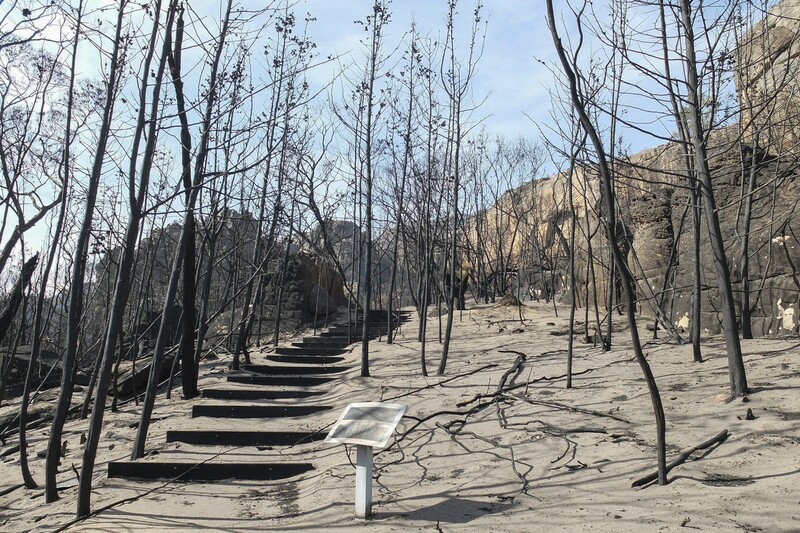 Loss of vegetation, loose rocks, unstable soils and loss of access tracks means any foot traffic will have long term impacts on the recovery of the environment. 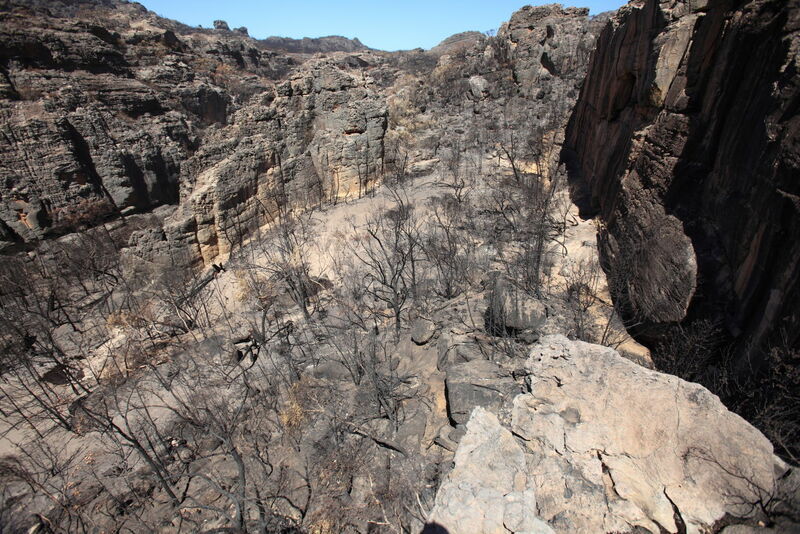 Impacts now will also affect the sustainability of rock climbing sites well into the future. Please respect the fragility of the environment and support the long term recovery of the Northern Grampians by remaining out of any closed areas. While Parks Victoria regrets the need to enforce closures, substantial fines will be imposed on those found in any closed, fire affected area. Parks Victoria recognises the importance and popularity of the Northern Grampians to the rock climbing and bouldering communities and will be working closely with industry and community representatives throughout a staged reopening process. Environmental considerations will largely determine when sites are available to be reopened, and replacement of damaged infrastructure will occur as suitable funding is available. As part of the recovery process, Parks Victoria will be identifying alternative options for climbing and bouldering, and will closely monitor impacts on these sites as their use and popularity increases. There will also be significant work done on the future experience of visitors in the Northern Grampians. Parks Victoria is continuing to improve its understanding of the needs of climbers and boulderers and is intent on providing an experience that is well respected, regarded, promoted and understood throughout the Australian and International Climbing and bouldering communities. Parks Victoria will be relying heavily on the climbing industry to work together to spread the messages about the fragility of the landscape and the long term sustainability of rock climbing in the Grampians. There may be opportunities for licenced tour operators, school and community based groups to become involved in the recovery process. Due to closures in the Northern Grampians, the availability of rock climbing, camping, car touring and bushwalking experiences is limited. Sourcing information on available campgrounds and other accommodation options is recommended. 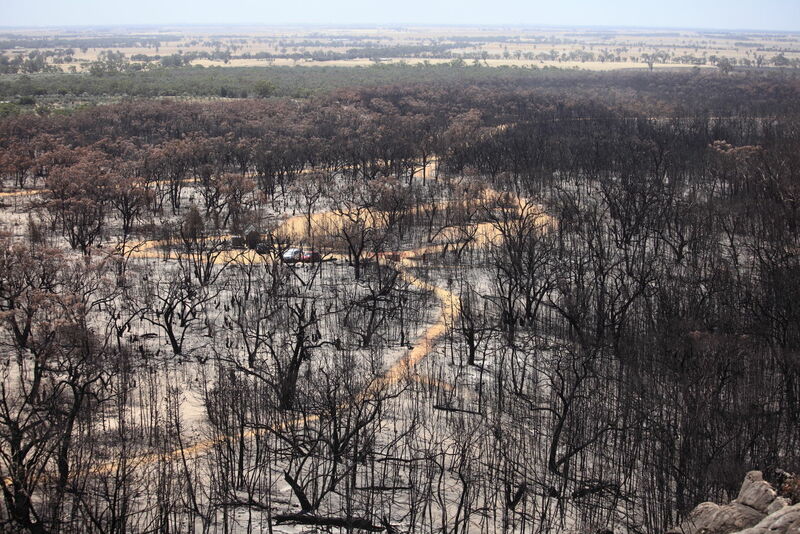 Please visit www.parkweb.vic.gov.au for park maps and regular Grampians fire recovery updates. This entry was posted in Grampians, Parks Victoria updates & info and tagged Bushfires, closures, cultural heritage site, grampians, hollow mountain, mt rosea, Northern Grampians, parks victoria, reopenings, rules and regulations, THE GALLERY, victoria range by Tracey. Bookmark the permalink.